Australia's Test series with India will now begin in Adelaide on 9 December following the death of Phillip Hughes. The four-match contest should have begun in Brisbane on Thursday, but that Test will now start on 17 December. The traditional Melbourne Boxing Day Test is unchanged, but the Sydney Test is put back three days to 6 January. The changes have been made because of welfare concerns for Australia's players grieving for Hughes, 25, whose funeral will take place on Wednesday. The left-handed Australia opener died on Thursday after being struck on the neck by a ball during a domestic Sheffield Shield match. 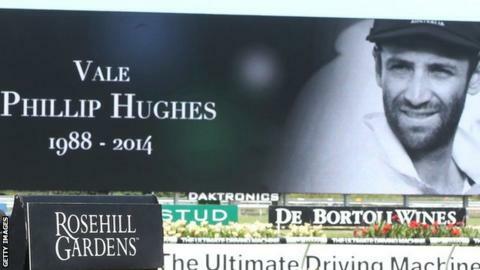 The funeral service will take place in the sports hall of Macksville High School, which Hughes attended, and will be broadcast live in Australia and on big screens at the Sydney Cricket Ground and Adelaide Oval. "Nobody should underestimate just what these players are going through right now," said Cricket Australia chief executive James Sutherland. "These are difficult days and we need to support them in dealing with their grief. It's very clear that playing a Test right now is just too soon and we are reacting accordingly. "While this wasn't done by design, it is somewhat fitting that the first Test will take place in Adelaide at Phillip's adopted home ground where we hope the match can be a seen as a celebration of his life." The India squad, currently in Adelaide, were supposed to fly to Brisbane on Monday but missed their flight. Their two-day warm-up match against a Cricket Australia XI in Adelaide, scheduled for Friday and Saturday last week, was cancelled. It has been reported that the Indians may now play a tour game in Adelaide on Thursday and Friday. After the Test series with India, Australia then face the tourists in a triangular one-day international series that also involves England. Two of those games have already been switched. Australia and England will now open the series in Sydney on 16 January, with the Aussies taking on India in Melbourne two days later.